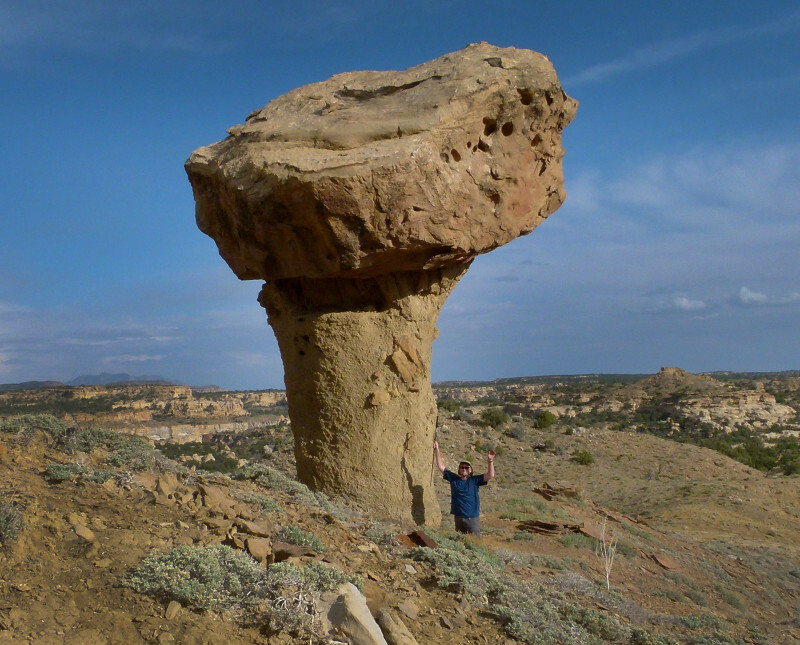 Muley Mushroom – Across Utah! 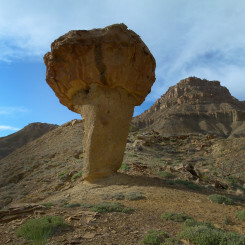 This interesting toadstool/hoodoo/balanced rock lives in a remote section of desert below Tarantula Mesa west of the Henry Mountains and east of Capitol Reef National Park. 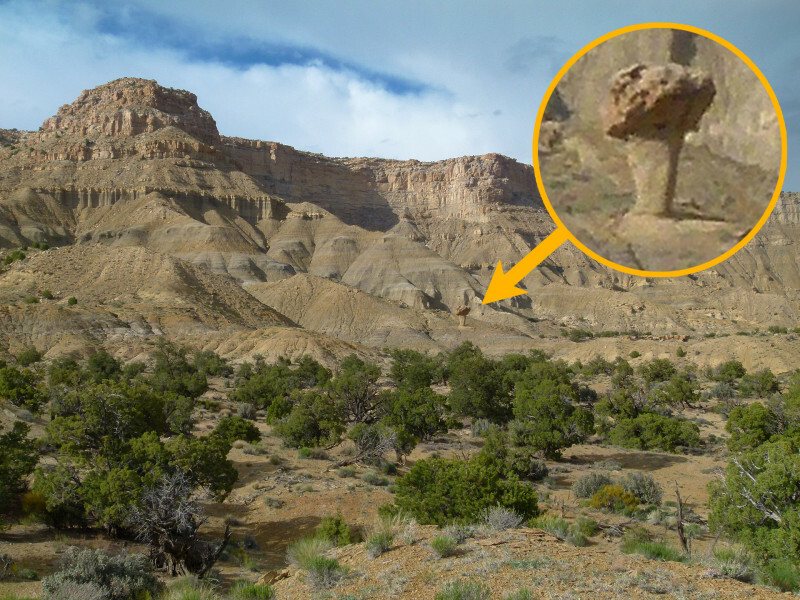 As far as I know the rock formation doesn’t have an official name, thus I’ve referred to it by its location near upper Muley Creek (dry). Though it’s an impressive sight, its not worthy as a destination on its own IHMO. 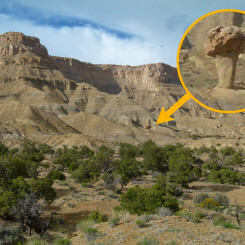 Thus, I’m not going to detail the approximate 10-mile route for those wishing to hike in from Capitol Reef. 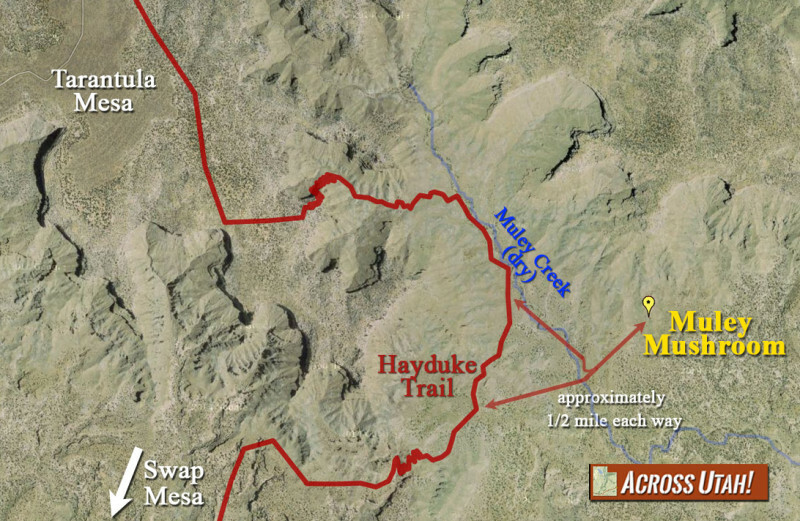 However, for those hiking the Hayduke Trail or other long hikes, the Muley Mushroom is just a short distance off the main route. In this case it’s an easy “drop-the-bag” half mile out and back to see this cool formation — don’t let the lack of superlatives dissuade you if you are that close! 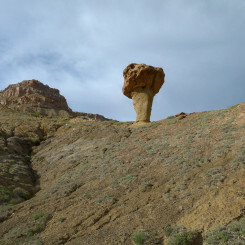 Muley Mushroom can actually be seen from the Hayduke Trail if one has a keen eye (and is looking the right direction). However, I wouldn’t count on this and instead recommend taking good notes of its location to make the side trip as easy and quick as possible. Once you leave Muley Creek wash headed east, gain high ground and then you should be able to spot the rock in the distance. If not, you might be too far north and need to contour a little more SE before having a good line-of-sight up the correct gully to the formation. 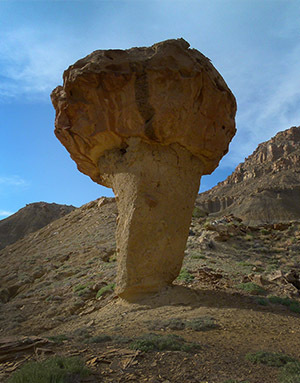 Once the mushroom is in sight it’s not too long of a walk up the wash to get below the formation. 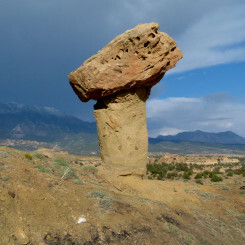 Here you are likely to find dramatic views with the balanced rock against the sky. Once above the mushroom it’s possible to shoot with a backdrop of Mount Pennell and Mount Hillers or the Little Rockies farther south with the system of canyons of Muley Creek. 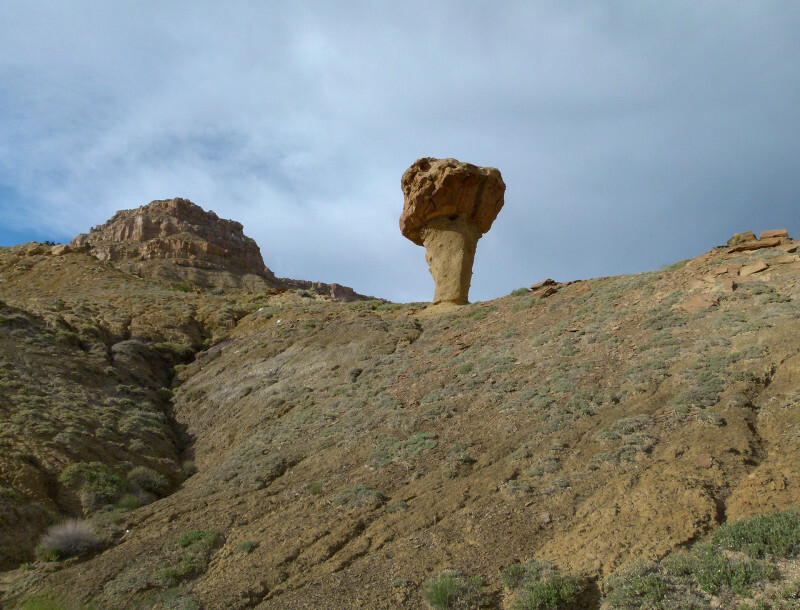 The Muley Mushroom is just one of many interesting formations in the general area, but I think its size and isolation make it worth a visit (if already close). 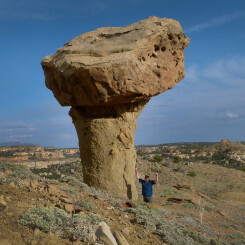 Tagged Balance Rock, Capitol Reef, Hayduke Trail, Henry Mountains, Hoodoo, Muley Mushroom, Pedestals, Toadstool, Utah. I loved the mule toadstool. 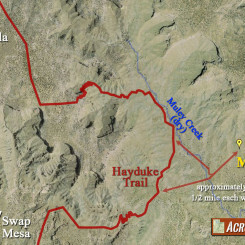 It seems that you do not advise it if you are not on the hayduke trail? Sorry so long to get back to you. Very busy. It’s an easy diversion for Hayduke Hikers. But for others, it would be a long ways out of the way. I think there are better spots nearby if wanting a long day hike or an overnighter. Such a cool formation – there’s nothing like Utah! Cool. Thanks! I think I know where this is:) Happy New Year to you mister.